As parents, you need to help teach and guide your child until they can become fully independent individuals. Some parents may feel as if they are doing their children a favor if they do something for them instead, but this can be detrimental in the long run. If your child is used to having things done for them, they do not learn to be resourceful and will depend on others even when they are older. This can be tricky for parents who may not know how to help their kids, especially with things like homework. Helping kids with homework can be particularly troublesome for several reasons. You may fall into one of two categories: 1) you may end up doing the assignment for them without teaching them anything or 2) you may not remember how to complete the homework your child was given. 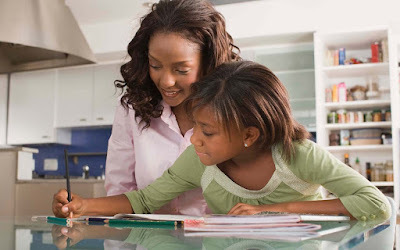 Therefore, we have some tips on how to tackle homework trouble and make sure that your kids get a better grasp on their school assignments as well. It’s important for parents to enforce the idea of doing homework, but forcing a child to get work done may not end up working in your favor. Parents can guide kids into finding a time and place that helps them focus and think the best. Some kids work better with more structure, whether they are in a library or setting up their assignments in a parent’s study. Other kids however may enjoy more casual settings like the living room or in the kitchen with a snack to help get them motivated. Once kids find out what works best for them in terms of location, environment and other factors, getting the actual homework done will be much easier. em that you’ll be with them in a minute or when you’re done doing whatever it is you’re doing while they work, giving them some time to think about their problem or question before you sweep in to rescue them. If they ask you to help with every single homework question they have, they may have a bigger problem or they may be relying on you to get their homework done quicker and easier. It’s Okay to Ask for Help, too! As a parent, it’s probably been awhile since you’ve done any long division and you may not completely remember all the names of the presidents. Your kids may ask you for help with homework that you aren’t sure how to answer clearly yourself, but it is important that you use this opportunity as a learning experience instead of making something up or faking it. Consulting educational websites, Google or other tools can help you assist your child’s more difficult homework questions – but parents be warned! The Internet, library, and other sources can be helpful and it’s great to teach kids how to use resources, too, but when it comes to tools like calculators or the Internet, it’s important to also teach kids that taking shortcuts may be easy but is not always the answer. Know where to draw the line. For example, some math problems can only be completed using calculators, but if your child’s homework calls for them to complete a long division problem and show their work, limit calculator usage to simply testing answers, or in the case of the internet, limit Google searches for questions needing clarification. As your child gets older, their homework will change and so will their habits. No matter what, it’s vital that kids learn on their own, even (and sometimes especially) when they make mistakes. Encourage them to ask questions but to also be independent and resourceful when trying to find an answer before relying on someone else. For reading tips and parenting resources be sure to follow the KD Novelties Blog.